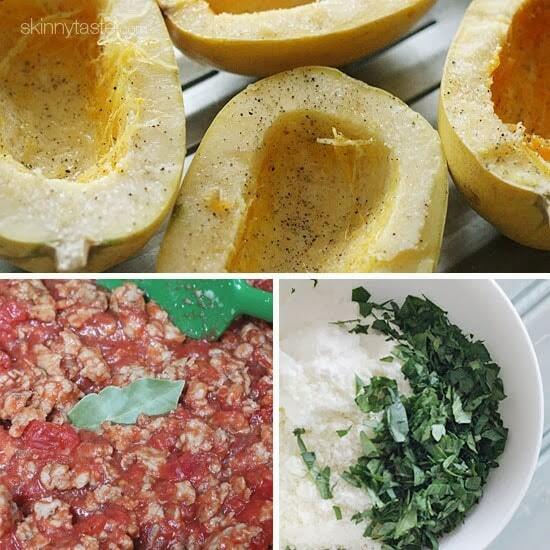 What do you put on your Spaghetti Squash? I top mine with almost anything I love on pasta, like these easy Spaghetti Squash Sausage Lasagna Boats. Perfect if you’re craving something decadent and delicious without overdoing the calories! Filled with everything I love on my lasagna – chicken sausage, tomato sauce, ricotta, parmesan and mozzarella cheese. A delicious, healthier lasagna that is low-carb, low-calorie, under 300 calories and 7 Smart Points if you’re on Weight Watchers, and it’s filling! It’s also gluten free and so delicious. How do you prevent spaghetti squash from getting too watery? Spaghetti squash has a lot of liquid, when cooked so I find it helpful to place it in a colander over paper towels to help get red of the excess moisture and it works perfectly. 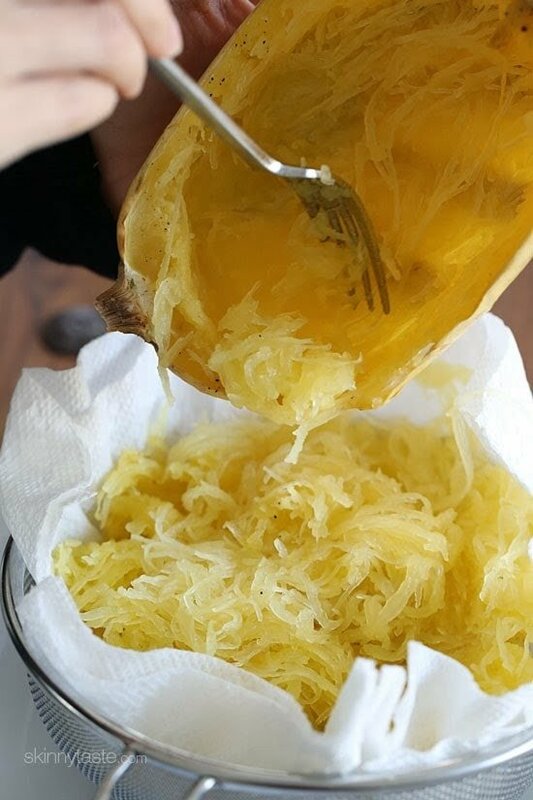 Roasting spaghetti squash will give you the best results, if you microwave or make your spaghetti squash in the slow cooker, it will have a lot more liquid. You can prep this ahead of time, then put it on the oven just before you’re ready to bake. If you happen to only find large spaghetti squash, you can place the mixture in a 9×9 baking dish instead of the shells. Enjoy!! 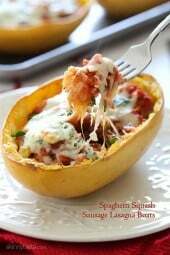 Here’s a few more spaghetti squash recipes I think you will love! 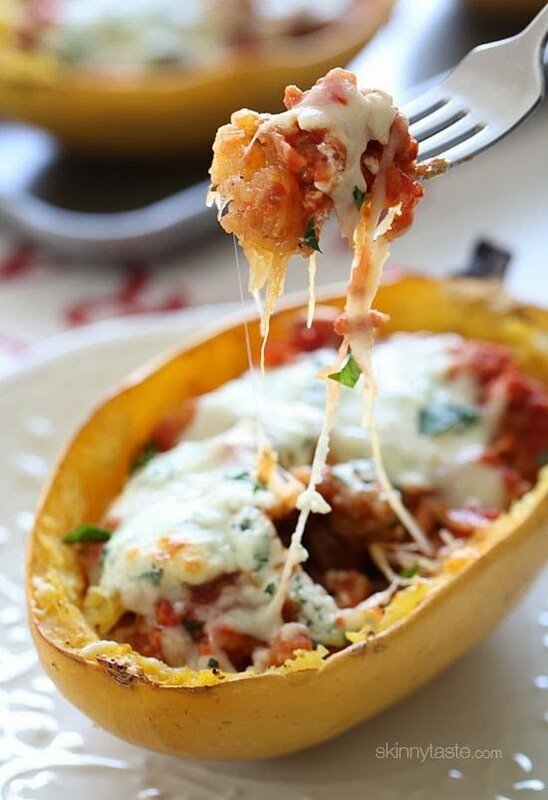 If you’re craving something decadent and delicious without overdoing the calories, you’ll love these delicious spaghetti squash boats filled with everything you love about lasagna – chicken sausage, tomato sauce, ricotta, parmesan and mozzarella cheese. Cut spaghetti squash in half lengthwise and scoop out seeds and membrane. Season lightly with salt and black pepper; bake about 1 hour, or longer if needed on a baking sheet, cut side down. If you prefer the microwave, cut squash in half lengthwise, scoop out seeds and fibers and place on a microwave safe dish and cover. Microwave 8-9 minutes or until soft. In a large deep sauté pan, heat oil and add onions and garlic; sauté on medium-low for about 3 to 4 minutes, until soft. Add the sausage and cook, breaking up into smaller pieces until browned and cooked through. When cooked, add the crushed tomatoes and adjust salt and pepper to taste. Add the bay leaf and cover, reducing heat to low. Simmer 20 to 30 minutes, then add in fresh basil at the very end. When the spaghetti squash is cool enough to handle, use a fork to remove flesh, which will come out in spaghetti looking strands reserving the shells. Drain the squash on a paper towel to soak up any excess liquid, then toss with half of the sauce. Place the spaghetti squash back into the 6 shells and place on a baking sheet. Top each with remaining sauce, 1 tbsp ricotta cheese mixture, and 2 tbsp mozzarella cheese.Bake in the oven for 20 – 30 minutes or until everything is hot and the cheese is melted. I put this in two small casserole dishes so I could freeze one for later. I wonder what brand of sausage you used and if it is raw or fully cooked because when I plugged the ingredients into the recipe builder I got 5 smart points on weight watchers. I was not able to find fresh chicken sausage but used raw sweet italian turkey sausage made by Jennie-O, using only the amount 14 ounces of the package.This is really good and will definitely make it again. Made this last night and added some pan roasted eggplant cut into 1/2 cubes, baked in a casserole dish vs. putting back into the shells and used a jar of Roa’s marinara to save some time. Amazing!! Here is another tip: I just discovered using a POTATO MASHER helps break up the chicken sausage. This helps with ground turkey also. BTW: Love your recipes! We made this using sausage in the casing, browned it off in the skillet with some Pam, then sliced it and carried on with the recipe. Had to substitute cottage cheese for the ricotta. Otherwise it was a HUGE hit! My husband said “this is probably one of the best things you’ve made, ever! You can make this again!” There were NO leftovers. How do I prepare this to take to work? we do not have an oven to bake it in for 30 min right before eating. just a microwave. Delicious and Easy – except cutting the spaghetti squash in half! So yummy! Just made tonight. Our 1st spaghetti squash experience : ) I used basil throughout vs. parsley and used Italian crushed tomatoes vs. plain. Will make again. Thanks for sharing! If all of your faux lasagna recipes this is my favorite!!! I love making this for lunches for the week! Never gets old for me! I’m assuming it can be baked in a casserole instead of the squash shell. Wold any modified made? Made this tonight, and it was wonderful. My husband gave it the thumbs up. He is used to eating real noodles and beef. He said it really filled him up. I am freezing the rest. Hi Gina. Would you please tell me the easiest way to cut the Spaghetti Squash? It is very hard to split in half. Thanks Nadin! This was good! More of a fall/winter dish but I had the ingredients in summer so I made it early in the day and reheated. Nice flavor and so nice to get those veggies in the family! When you totaled up your smart points how many were your spaghetti squash? Wasn’t sure if it was considered a free food or not. The hardest part for me is cutting the Spaghetti squash in half…what are your tips for that? This was fantastic!!! I didn’t put the squash mixture back in the shells, but instead put everything in a cast iron pan and baked it that way and it turned out perfectly (less messy too). What a wonderful, healthy dinner – I can’t wait to make it again! Wondering if after cooking can it be frozen for future dinners? Gina, found your recipemon another website. Makes me so angry for you to see people claiming your recipes as their own. Thank you so much for letting me know, I am addressing the issue. Damn. Who knew squash could turn into magic? Thanks Gina! These are delicious!!! We made these for dinner this week and they are so satisfying and tasty. We will definitely be making them again. I added little extra sausage and really liked the ratio. Loved this! So tasty!!! We have 4 leftover though… any advice for reheating them this week??? I made them on the weekend during our meal prep and reheated them in the microwave and it was delicious. I’m sure you could bake them too. LOVE THIS DISH! My husband and I loved loved loved this! Thanks Gina! I put this recipe in Weight Watchers and it keeps coming out to 5 Smart Points- am I missing something? By the way, this looks delicious and I’m making it tonight. Absolutely delicious! I made these yesterday afternoon and popped in the oven at 400 for 25 minutes covered and 10 uncovered. Perfect amount of time to make a salad and set the table for dinner. Thanks for creating delicious and nutritious recipes! Wow, was this delicious and gorgeous. I didn’t have the presentation problems others had. Wish I’d had fresh basil but didn’t matter. Yum. I didn’t know what to do with the parm, so I threw it in the sauce. I also mixed the ricotta and half the mozzarella into the squash before spooning it in the shells, then topped it with more mozzarella. Thanks for another winner! Can I take out meat and use shrimp or black beans instead or is that real odd? I haven’t tried it, if you do let me know! Can I substitute the turkey sausage with extra lean group beef? This is delicious! My 3 year old loved it! My husband didn’t come up for a breath 🙂 thank you! This recipe really does work well. Especially for those on a lower carb diet. I am making it for the second time. I found that if you put all the ingredients in the shell (after cooking the squash and sausage) and then leave it in the fridge over night (I always make way more than we can eat in one serving) and then cook it the next day the flavors seep in more giving it a fuller flavor. Plus leftovers are always a great time saver. Thank you so much for the recipe! I am an avid reader, but rarely comment. We made this last night for dinner and loved it! We used 93% lean ground beef and cherry tomato slow cooker sauce (we grow way too many tomatoes). The squash were huge and developed a couple of holes while baking, so I used a 9×13 pan. It turned out great, and my husband didn’t miss the pasta! Great! Glad you enjoyed it! Fresh tomatoes are great! Does anyone the Sat fat content? I want to save this recipe in the WW app on my phone but Sat fat is needed for SP. Just finished making it the sausage its really good. I accidentally over baked the squash and I put 1 tbsp of fresh basil but this basil was too much for me. Do I mix the spaghetti squash into the meat and sauce? As everyone else has said, this recipe was SUPER tasty! I was so pleased considering it was my first time cooking with spaghetti squash (I cut mine in half, stabbed a few holes, and microwaved facing up for about 8 minutes). My only (semi) negative is that it took me a long time to make this recipe, like over an hour; however, I am newer to cooking and not very fast. Luckily I cook for myself only and am able to get several meals out of this so that reason, and because it is so tasty, really makes the time put in worth it. Thanks for all your healthy recipes Gina, yours is my go to page when I am looking for something new to cook! Can you use ground chicken or turkey instead of sausage? has anyone tried it? You can sub either, but it will alter the taste and the saltiness of the dish. This was PHENOMENAL!!! I used leftover meat sauce I had frozen instead. YUMMY! This will be going in our regular rotation. THANK YOU! This recipe sounds delish- I haven't been disappointed by anything of yours that I've made yet… I have just one problem- ricotta cheese. My husband & I aren't fans. Any substitution suggestions? I use cottage cheese in lasagna much of the time because ricotta can be gritty. Works perfectly there, should work here too. Amazing!!! Made this for dinner last night. I used Jimmy Dean hot sausage and drained the grease. I have always cooked my squash in the microwave until tender. (Only way to go). Couldn't find small squash so used two. 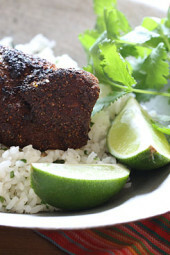 They were so good that we not only had them for dinner last night, we heated the other 2 halves for a huge lunch today. WOW!!! I want to make this but for 2. 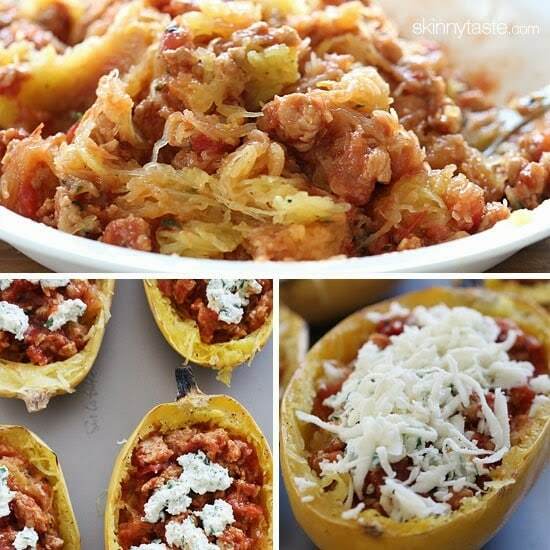 Using 1 spaghetti squash, how would I break down the ingredients? I’m going to do the same. Prepare the meat mixture and divide into 3 portions. Use 1 wiith 1 squash and freeze the other 2 portions for filling future squash boats. I am so happy to have this for dinner tonight! you have helped me loose 40 lbs! I share your website with anyone who asks about my weight loss! Made this for dinner tonight!!!!! SO DELICIOUS!!! Can't wait to make this again!!! Great comfort food!! I made this dish for my roommate and I. His with sausage and mine with Yves Ground Round. I also used my own frozen marinara sauce which I keep frozen. Delicious taste and very filling. Thank you so much. I have made this so many times for my family and we LOVE it! I made it on the grill last night because it's already hot here in AZ and it turned out great. Thanks for sharing! Loved this! I want to try it vegetarian style. Lots of veggies and no meat. Anyone try that yet? I made this last night. It was fantastic! I modified for our specific allergies and it was still fantastic. My 6-yr-old loved it. I loved it. My husband loved it. Thanks for sharing. Do you take the casing off the sausage? Just made this tonight with ground turkey instead of sausage….Yum! Definitely doesn't taste skinny!! Thanks for another awesome recipe! Made this today. Forgot to drain after I pulled the squash out but will definitely make this again and poke holes like someone suggested. I also overcooked but still tastes good! Have you actually frozen this particular recipe? Any tips are gladly appreciated since others say it’s a no can do. I'm diabetic so i make spaghetti squash lasagna fairly often. Ive also made it with zucchini squash..both are delicious. I use my homemade sauce, ricotta, matz cheese, and grated parm. I use my meat sauce, u can use any meat u like. Layer it sauce,squash, cheeses, ricotta, then start. over. I usually make three layers. Pop in oven on 350 for an hour. (Cook the squash as above) dont worry about t the ratio of sauce to squash. Make it your own. YUMMY…ENJOY !! I put my spaghetti in the microwave for 15 minutes. Perfectly cooked. Make sure you poke several holes in it before cooking. I love this site! I've recently started carb cycling and just eating healthier overall. I find myself continuously going back to your site for ideas and recipes! Thanks! I made this yesterday and it was delicious! The boats also make convenient leftovers. I prepared the 6 boats, but only cooked 2 for my Husband and I the first night. I wrapped the other boats in foil and put them in the fridge right after topping with cheese. The next evening, I took the leftover boats from the fridge and baked them for the remaining 30 minutes at 400 degrees. They turned out great! I wonder if you could leave the spaghetti squash as is after baking, and not remove the strands, fill it with the mixture and bake as stated. Then when ready to eat you would pull sauce and strands onto each bite. 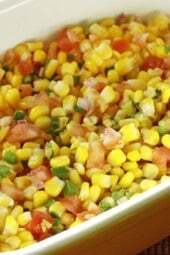 making this dish tonight, in preparation for dinner on Friday night with my soon-to-be SILs! Gotta impress the new family!! Just a note – your ingredient list didn't include the bay leaf. Glad I had them on hand!! 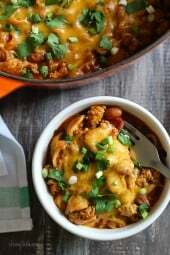 My roommate and I tried this recipe and we loved it! It tastes great as leftovers as well! Made this tonight. Turned out beautifully. I've never cooked with spaghetti squash, but it was very easy. Can you clarify your points, How many points is one boat 2-3pts and 8 for all three? My husband and I have made this twice now and it is amazing. We used crushed tomatoes so it was almost a tomato sauce over all of the squash. We also drained some cottage cheese and layered it with all of the other ingredients. We ended up using a casserole dish and have gotten 3 meals a piece out of it. We really enjoy a lot of the recipes on here. I recommend the salmon cakes as well! I made this last night too! Very good! My store doesn't sell chicken sausage so I subbed lean ground beef that I made into "sausage" by using this recipe: http://www.food.com/recipe/seasoning-for-ground-pork-italian-style-sausage-178446. I also used fire roasted tomatos — those made the sauce extra yummy! So delicious! Felt like I was cheating! Mine were not as pretty but overall great recipe. Thanks for sharing! I made this today and it was AMAZING! Will definitely make this again! My husband was pretty sceptical about this idea, but I made it anyway. He was surprised that he actually liked it. We both ate untill we were stuffed. Then, he packed the left overs for his lunch the next day! Home Run! Made this for dinner tonight and it was fantastic!! What a great way to have the flavors of a traditional lasagna without all the guilt! Love it! Just made this for dinner,it was delicious.Thanks Gina,love your website,have incorporated many of your recipes into my diet,all have been winners! I love this recipe. It takes all the delicious elements while leaving out the bad. Being gluten free lasagne is a thing of the past for me. Gluten free pastas are just not the same. Now I can get those flavours without the excess calories AND no gluten Thanks! I made this for the first time this evening. I do make spaghetti squash often but never mixed it and put it back in the shell. It was fantastic. Your website is full of great ideas for those of us trying to cut back on the carbs and sugars. I really appreciate your time and effort. I made it tonight and it was awesome. Thank you!!!! This was DELISH!!!! Thank you! We made this last night and it was amazing! Thank you! One caveat, and this echoes comments I saw on a similar recipe on Epicurious — this just isn't a pretty dish. The word "gloppy" comes to mind. So I wouldn't make it for company, but it was very tasty for us. That was awesome! met all my expectations! I couldn't find any Italian chicken sausage, so I used half & half Italian pork and beef then rinsed it after I cooked it. It was amazing! Can you give an estimated weight range for 'small to medium' squash? Thanks! I'm a guy who likes pasta and sauce a lot, but I have to tell you, this spaghetti squash and sauce is freak'n awesome, we made it this weekend for our family as a surprise dish with meatballs and hot sausage, they all loved it…. I think the squash will get too watery if you freeze it with the sauce and cheeses. If you can, cook the squash a few days before the holiday and scrape the flesh out and drain as directed. Then store the flesh in an airtight container (like Tupperware) and also save the shells in a separate container or ziplock bag. Assemble everything the morning of your meal and then bake just before you plan to eat. I know using the shells makes a nice presentation but this can be made in a regular casserole dish too and then each person can take as much as they would like. One half of a smallish squash was very filling. I'm allergic to chicken and will be substituting veggie burger crumbles for the chicken sausage. Do you know how many total PPV the 14 ozs of chicken sausage is? I'd like to adjust accordingly. I'm wondering the same about the spaghetti squash. I've only cooked it once and had the same problem – one squash came out in stands and the second didn't. Bake it cut side down next time, I find it cooks better. Try poking vent holes through the squash shell once it's upside down to help let that moisture escape while baking. I also do not use the olive oil on the inside of the squash. Microwave cut halves in 1/2 of water for 15 min. They come out perfect. Cut the spaghetti squash in half lengthwise then put them cut side down in a dish. Add the water and cover with plastic wrap to microwave. This creates a steamer situation that cooks the squash. Looks great Gina! 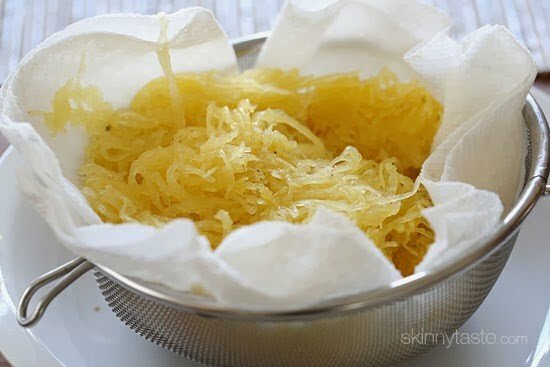 Quick question – the few times I've cooked spaghetti squash I can never get it to come apart in the strands. Any idea of what I might be doing wrong? Cooking it too long, not enough? Tip the squash up on one end and scrape down with a fork, then reverse the squash to get the strands out of the other end. It was probably not cooked through. It should fall easily with a fork. Next time bake it cut side down, I think it's better and won't dry out. CUT YOU SQUASH IN HALF– LENGTH-WISE. DIG OUT THE SEEDS AND PLACE THE SQUASH FACING DOWN IN A BAKING DISH WITH ABOUT 1/2 INCH OF WATER. BAKE IN A 350 OVEN UNTIL YOUR FORK GOES EASILY THRU THE SHELL- 45 MINS TO AN HOUR SHOULD BE GOOD. you are overcooking it. if the texture is like other squash, it's overcooked. 45 mins should do it, and the strands come out slightly crunchy like al dente pasta. remember, you're going to cook it some more with the baking so under is better than over. BEST WAY to cook spaghetti squash so it doesn't absorb any more moisture then it already has.. and perfect every time.. Place in Slow Cooker UNCUT with 1/2 cup water and cook on HIGH for 2.5 hrs.. Once cooking time has lapsed let squash cool till you can handle it. Cut it in half and drain the little bit if water out. Then scoop out the seeds. Use a spoon to scoop out the meat of the squash and then a fork to loosen the noodles. This way is the perfect way to also reuse the shell of the squash if you want to serve it in it's shell.. makes a nice presentation! I tried this tonight. Thanks!! It came perfect. This is how i will be making my spaghetti squash from now on!! I usually bake mine with no problems but this slow cooker way worked GREAT also, and much easier to cut open to remove the seeds! THANK YOU!